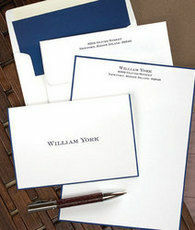 Navy edging is hand applied to each sheet, sized 5.75" x 7.75". You select white or ivory stock and typestyle. 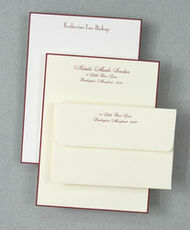 Set of 25 sheets & envelopes. Your imprint is featured in the raised ink color of your choice. Two line return address on envelopes available. Typestyles are upper-lowercase and sized only as shown. Positioning only as shown.